"I like to paint the larger North American game animals and birds of prey. I'm probably a little bit of both a wilderness artist and a wildlife artist, although some of my rural landscapes would't fall into either category." - Brent Townsend. 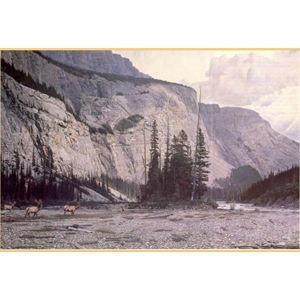 What interested him as the subject of this painting was a stretch of landscape off the highway that runs between Jasper and Banff, south of the Columbia ice fields. "I was struck by the background," he says, "and I got into the situation of asking myself, 'What do you really want to paint here?' Then I recalled seeing four bull elk north of there, wading out in a shallow lake. That was what gave me the idea for Riverbed."